Former PQ cabinet minister in the Levesque government Lise Payette at a conference at the Institut du Nouveau Monde in Laval, Que., August 15, 2015. Lise Payette's successful turns as a journalist, politician and television screenwriter were shaped by her trailblazing feminist views. Among her legacies were her province's no-fault automobile insurance plan, the adoption of the motto "Je me souviens" on Quebec car registration plates and the possibility for children to retain their mother's surname as part of a hyphenated family name. Ms. Payette was surrounded by friends and relatives when she died Wednesday, her family said in a statement. She was 87. 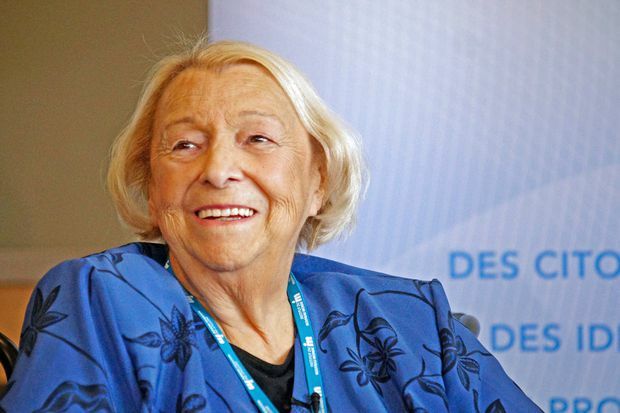 “Lise Ouimet Payette managed to take control of her destiny and advance Quebec society through her determination, courage and willingness to offer the generations that followed a better and more equal world,” the statement said. Raised in a family where her maternal grandmother rejected conventions but her father considered that girls didn't need to go to school because they were destined "to change diapers," Ms. Payette became an opinionated public figure with an ability to anticipate the changing social mores of Quebeckers. However, her outspokenness also landed her in trouble, whether during the 1980 referendum campaign or more recently in her show of sympathy for film director Claude Jutra when he was posthumously accused of sexually abusing boys. During an interview with The Globe and Mail 28 years ago, she acknowledged she had already lived an eventful life. "Ah, there have been myths about me for 30 years," she said with a weary smile. She was born Lise Ouimet in Montreal, on Aug. 29, 1931. One of the two daughters of Cécile Chartier, a maid, and Fernand Ouimet, a bus driver, she grew up in the working-class St-Henri neighbourhood. In the 2014 documentary Lise Payette: Un peu plus haut, un peu plus loin, she recalled that her combative attitude was shaped early in childhood by her maverick maternal grandmother, Marie-Louise Chartier. In the staunchly religious Quebec of the time, Ms. Chartier had rejected the Catholic Church after she was denied absolution when she tried to space out her nine pregnancies. "It's just as easy to live standing up as it is on your knees," the grandmother told young Lise. Ms. Payette also acquired during her youth a sense of the fragility of French culture in Quebec, she said in a 1990 interview with The Globe and Mail. One of her early aspirations was to be a singer but she didn't know of any successful Quebec francophone singers so she pictured herself with an English stage name, Kathleen Jackson. Her father didn't think his girls needed education. "You're not ugly, you'll get married," he told them. At the insistence of her mother, young Lise was sent to the Ste-Angèle Catholic boarding school. However, while her intelligence was noted by the teaching nuns, she never went to university because the family couldn't afford it. So she left school at 19 and the next year married the journalist André Payette. While raising three children, she began a journalism career, hosting small-town radio shows, writing for weeklies. She moved to Paris in 1958 when her husband was posted there for Radio-Canada. During those six years, she raised her profile as a journalist, interviewing prominent French writers and artists like Henry de Montherlant, François Mauriac, Gilbert Bécaud, Maurice Chevalier. Her most influential work of that period was the talk show Appelez-moi Lise, where she combined wit, impertinence and a willingness to ask difficult questions. Before the launch, Radio-Canada had sent her to the U.S. to see how Johnny Carson did it. But she found the American show too scripted. She preferred asking spontaneous zingers to her guests. "I like them to wake up a little scared on the day of the show," she told The Globe and Mail in a 1976 interview. "How come you can't get elected?" she asked René Lévesque after he had failed twice to get a seat as Parti Québécois leader. The show turned her into a Quebec institution. In the documentary about her, the television writer Stéphane Laporte noted that Ms. Payette became the Oprah Winfrey of Quebec. And despite her tough questioning of Mr. Lévesque, he recruited her as a star candidate for his party for the 1976 election that carried the PQ to power. In one of the iconic photos of Quebec history, she stood near him as he gave his victory speech before a jubilant crowd at the Paul Sauvé arena. Former Quebec Premier René Lévesque, shown left, with Lise Payette, right, in this 1976 file photo tries to hush supporters after the Parti Quebecois provincial election win. She became a member of the first PQ cabinet, which adopted a series of reform-minded legislations. Still, in her 1982 memoirs, Le pouvoir? Connais pas!, she recalled her frustrations about her male colleagues. She was stunned when Mr. Lévesque offered her the one portfolio that had been held by a woman in the previous government, that of consumer affairs. "I choked. I was furious, but too polite to let it show. I felt like calling him names." Nevertheless, it was in her portfolio, as Minister of Consumers, Cooperatives and Financial Institutions, that she introduced one of the legislative pillars of the PQ government, a compulsory no-fault automobile insurance plan for people injured or killed in car accidents. At the time, up to one-fifth of Quebec vehicle owners had no coverage at all and crash victims and their families had to wait until responsibility for an accident was determined before receiving insurance money. She also came up with the idea of putting the Quebec motto "Je me souviens" (I remember) on vehicle license plates. The PQ government wanted to replace the previous motto, "La belle province," feeling that Quebec was striving to be more than a province. Ms. Payette said she made the suggestion at a caucus meeting as the PQ scrambled to come up with an alternative phrase. "I felt it helped this people without a memory that we were," she recalled in a Radio-Canada interview in 1999. She also contributed to the revision of Quebec’s Civil Code, no longer making it obligatory for women to assume their husband’s family name upon marriage, as well as bringing in changes to allow children to carry the surnames of both parents. She had a less happy turn in the spotlight during the 1980 referendum, when she disparaged women who were reluctant to support Quebec independence, comparing them to Yvette, the docile little girl character in a widely used Quebec grade-school reading book. She said Quebec was filled with Yvettes and mocked Liberal Leader Claude Ryan as being married to one. It became a uniting cry for the federalist side, with 15,000 women dubbing themselves the Yvettes, holding a rally at the Montreal Forum. On May 20, 1980, the Yes side lost. Weeks later, the government banned school texts with sexist stereotypes, such as Yvette. The following year, Ms. Payette announced she wouldn't seek re-election. "I am not a career politician," she said. " ... Because of what I have been, because of what I am, I must regain my freedom of speech." She became a television writer, most notably as the creator of Des Dames de Coeur, a hit drama series that aired from 1986 to 1989. “[Des Dames de Coeur] is part of a new wave of Quebec TV dramas that are scoring big with young, upscale French Canadians who have traded in the passionate slogans of Québécois nationalism for the material verities of the yuppie ethos," Globe Quebec arts correspondent Matthew Fraser wrote. The series focused on the intertwined personal lives of four middle-aged urban women, but ironically its most memorable character was a man, Jean-Paul Belleau, a manipulative lothario. In an interview with the Globe, Ms. Payette said she had conceived Jean-Paul Belleau as a villain, not someone the audience would enjoy for his caddish ways. "One can't find the formula for how an audience will react." In 1989, she co-wrote and narrated a controversial documentary, Disparaître, which predicted the disappearance of francophone Quebec and was criticized for its portrayal of immigrants as a demographic threat. "It was a warning," she said, denying that it was racist, "a statement that if countries such as France and England had failed with policies ranging from multi-culturalism to assimilation, what would our fate be?" More recently, she was in the middle of other media storms. In 2016, three decades after his death by suicide, a biography revealed that Mr. Jutra, an iconic Quebec filmmaker, "had a penchant for younger boys." Ms. Payette tried to defend Mr. Jutra, whom she had known since childhood, and expressed skepticism about his accusers. She was criticized as being out of touch and failing to distinguish between homosexuality and pedophilia. A year later, in the wake of the Me Too movement, the journalist Léa Clermont-Dion alleged that she had been the victim of a sexual assault by her boss, Michel Venne. She then said that when she first talked about the incident around 2014 or 2015, Ms. Payette had called her and tried to talk her out of filing a complaint. Ms. Payette later acknowledged talking with Ms. Clermont-Dion and said she was only trying to protect the younger woman from a backlash. Ms. Payette leaves her three children, Dominique, a journalist, Sylvie, a playwright and Daniel, a lawyer. She was predeceased by her former husband André Payette and spouse Laurent Bourguignon.